Lepreon located 5 km upstream from Tholon, situated in the middle of the new road Pirgos-Kyparissia, will meet in a luxuriant vegetation of many waters running from everywhere, the village Strovitsa that lately named in Lepreon. 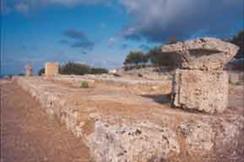 After the initial junction you reach the entrance of the village and from there starts on your left (North), a cemented road that takes you to the Acropolis of Ancient Lepreon. The Archaeological site is located on a hill with a wonderful view of the gulf Kyparissiakos, which, after enjoying, you can see the limestone Doric columns and altar at the entrance of the Temple, brought to light by the archaeologist N.Gialouris 1970. Further up you will see part of the Greek and Macedonian fortifications and a half-buried city gate. At Lepreon you will also find the Temple of Demeter. Also Temple of Zeus Lefkeou which did not exist when Pausanias went from there. 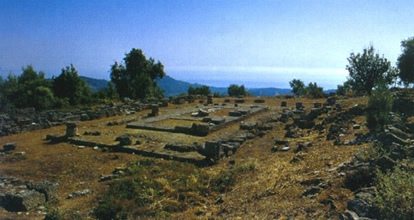 The Temple of Demeter is built in the southern part of the citadel of the Ancient classical Lepreon, on a terrace located at the lowest point of this and supervising the west sea, while to the south and east of the valley of the river Neda and the mountain range to the Temple of Epicurean Apollo at Bassai. It was mentioned by Pausanias, who said that it was built of mud bricks and didn’t have a devotional statue. The Temple is a Doric pavilion with 6 x 11 columns. Has vestibule with columns in antis, nave no inner colonnade, with no opisthodomos. It is made of shell stone, which was used for the newest phase of the city wall. From the temple stands the efthyntiria the occasion, the foundation of the nave and several architectural elements (vertebrae columns, capitals, fragments of the entablature). The entrance to the Temple was through three steps. The vertebrae of the columns bear twenty streaks and some preserve traces of white paint. The metopes were unadorned, while the roof had tiles of clay. The dating of the Temple is based solely on the architecture, as it is known for other discoveries. It can be compared with Temples located in the neighborhood and in particular with the register of Olympia and the Temple in Mazi. It should be dated to the first decades of the 4th century. B.C. The city was founded by the descendants of the Argonauts, the Minyes when expelled from Lemnos came once in Trifilia who lived Kafkones, and founded several cities. Lepreon was the principal and its inhabitants fought fierce battles for independence Trifylia by Ilian conquerors. The citadel of Lepreon located in the north of the village and there was a beautiful Doric Temple of limestone. The city was named after its founder Lepreos, Augeia’s nephew. The Acropolis of the Ancient Lepreon is one of the most impressive of Western Peloponnese and the excavations (1853-1940) revealed findings and evidence from the classical, Hellenistic and Roman times. The area of Ancient Lepreon was inhabited since the Neolithic Age (6,000 – 2,700 B.C.). The major flourishing is observed in the period after 1900 B.C. In the times of Pausanias (2nd century B.C.) the city had declined and Pausanias reports: “In my age neither any official tomb there was nor any sanctuary apart from that of Demeter’s, and even this was made with raw adobes”. However, the findings at the Temple of Demeter are impressive. Remarkable is also the Myth of the Hero Lepreos, who had the audacity to challenge Hercules to a competition of gluttony and excessive drinking. He beat Hercules and this encouraged him to ask Hercules to a duel, during which he lost his life. In his honour, the place was named after him. The Ancient citadel of Lepreon are at the bottom edges of the Mountain Minthi, and North of the river Neda. The great strategic importance in ancient times due to the position, having control of the land routes leading from the Messinia to Elis, on the Ionian to Arcadia. That’s why we claimed during periods Messinia, Lakonia and the Arcadians but mainly Elis. It was the most important city in Trifylia and pioneered the struggles of independence Trifilias cities against the Elis. “Lepreon hand on Trifylia alone” participated in the battle of Plataea and their name was written on the pedestal of the statue of Olympian Zeus.